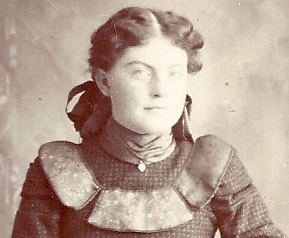 Mable Blanche (McGurn) Forquer – Donna Hundey Burke Weaver Archive, used with permission. Thirty years ago today, on 31 October 1984, my great grandmother, Mable Blanche (McGurn) Forquer (1882-1984), died at age 102. Grandma Mable was well-known in the family as a prankster and I remember her as pretty much always having a look of mischief in her eye. She was also quite fearless. I want to remember her today by sharing a story told by her youngest daughter, my great aunt Aleene (Dorothea Aleene [Forquer] Davis [1917-1999]). While living up north we had to go into Lake City for anything the little country store didn’t have. It was Mom’s delight to drive the team of horses for they were known to be the best around. And how Mom loved speed. Coming home from such a trip, and it must have been dark, a man tried to grab the bridle. It was thought that he knew it was the Forquer team and knew that the men often made the trip late at night to deposit money from the store. Anyway, Mom stood up in the buggy and laid the whip to the horses – needless to say the man fell off – and when they arrived at the livery barn the horses were hot with lather. No nighttime robber in the Michigan north woods was going to stop Grandma Mable. Dorothea Aleene Davis, manuscript, 1994; Donna Hundey Burke Weaver Archive, in possession of the author. What a personality Mable hat! This lady really knew how to take care of herself. Enjoyed reading her story. Thanks, Nancy. She was quite an amazing lady. What a great story! I can just see her, gritting her teeth and whaling away with the buggy whip! Enter your email address and click Subscribe to get new posts delivered to your in box.